Located in Banff, The Fairmont Banff Springs is in a state/national park and close to Banff Centre, Upper Hot Springs, and Banff Gondola. Nearby points of interest also include Cave and Basin National Historic Site and Mount Norquay Ski Resort. 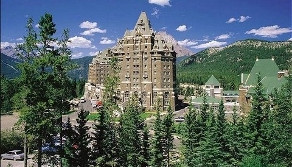 Dining options at The Fairmont Banff Springs include a restaurant and a coffee shop/café. A bar/lounge is open for drinks. Room service is available during limited hours. The resort serves Buffet breakfasts (surcharges apply). Recreational amenities include a golf course. Also located on site are an outdoor pool, an indoor pool, a children’s pool, and a health club. The property’s full-service health spa has massage/treatment rooms and beauty services. This 4-star property has a business center and offers small meeting rooms, a meeting/conference room, and secretarial services. High-speed (wired) Internet access (surcharge) is available in public areas. This Banff property has event space consisting of banquet facilities, conference/meeting rooms, a ballroom, and exhibit space. The property offers an area shuttle (surcharge). Business services, wedding services, concierge services, and tour assistance are available. Guest parking is limited, and available on a limited first-come, first-served basis (surcharge). Additional property amenities include a concierge desk, an arcade/game room, and multilingual staff.